Chris Lloyd - Maypole Pit Disaster - I am the great-grandson of Thomas Lloyd Who Died In The Disaster. I am looking for information about a pit explosion that killed my great uncle, James Byrne, in England between 1909 -1911. He was from Ireland. I am seeking the when and where of his accident. Having no other details I was hoping your website could direct me. Thank you for all your extensive information. I look forward to searching the sites you recommended. One item I would like to add is my father's cousin, Bridget Byrne, told me that she and her family visited the town in which the pit explosion occurred and she saw a large memorial plaque dedicated to all the men who died in the accident. From her discussion I believe it was a significant event in the town's history. In the 1911 census his wife indicates she is a widow and the youngest child was 3. From this I would place the explosion in the years 1908 through 1911. With the information I have (large pit explosion in UK between 1908 and 1911) do you think it is enough to find the town? Well, Fionn, thank you for the information and if anything comes to mind would you let me know? I am hoping someday to visit the town's memorial. I attached the 1900 Irish census which shows he was a farmer and living on the land. My understanding is that he would farm in the growing season and then leave during the fall and winter for the mines. Some time after 1908 he did not return. I have attached the 1911 Irish Census in which Margaret (Gill) Byrne states she is now a widow. I assume the Irish and English census forms were done at the same time of the year. James was gone at that time. He would not have been on either country's census having died before the 1911 census. In 1901 James Byrne married Maggie Gill (1878-1931) from Garryroe they had children - James Patrick born January 1902 in Cloonmore, Mayo (He Michael Gill & Bridget Byrne); Owen born February 1903 in Cloonmore, Mayo, Ireland; Pat Joseph born Feb 1904 in Cloonmore, Mayo; Mary Delia born March 1906 in Cloonmore, Mayo; Kathleen born January 1908 in Cloonmore, Mayo, Ireland. In 1901 census James Byrne (age 28 b1873) and Maggie (age 20 b1880) were living at house 22 in Cloonmore Upper (Murneen, Mayo). In 1911 census Mrs Maggie Byrne (age 33 b1878), widow, born in Mayo was farming and living at house 8 in Cloonmore, Upper (Murneen, Mayo) with her three children James Patrick (1901-); Owen (1902-); Mary Delia (1906-); Kathleen (1908-). 1910, 21st December, Pretoria Pit at Westhoughton, Lancashire. 344 killed. Hi Fionn, Thanks for the email. Well, I have found something. On the second site you recommended I found a J Byrne!  James Byrne, Irish, Coal Miner, Loader Below, 18 Attwood St, Kidsgrove, Stoke On Trent, Staffordshire.  Charles Byrne, Irish, Pit Bank Labourer, who had a son James Byrne but he was 12 and not down as doing anything. There were a lot of Irish miners from Mayo at the pit. This is getting interesting. In your site under the 1908 Maypole Disaster I see a "James Byrne, 36, contractors man." The age listed is very close to his age and being a farmer in Co. Mayo, Ireland and working the mines seasonally it would make sense that he would work for a contractor who would hire men as needed. Do you know if there would be any archived records left from the mine or the contractor at a museum in the town? Is this area near Wales? WOW! I am still reading, but you have uncovered a wealth of information on my Gill family. Well, I think I have now found the town and the mining accident in which he died. I am still processing all this info. 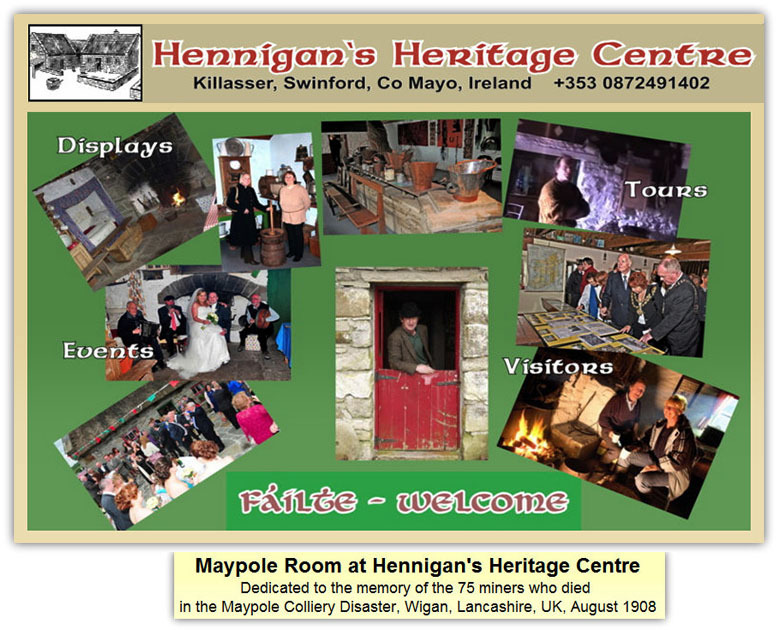 Last night I found, thru your site, the Hennigan Heritage Museum site. http://hennigansheritage.com in Ireland which posted a list of the miners with the corrected spellings of the names "JBurns ... James Byrne." See: http://hennigansheritage.com/Maypole.html There are photos of the dedication and opening of the Maypole Museum. Now, today, you provided someone's info that matches my Gill family. James married my grandfather's sister, Margaret. All those names are familiar to me. What a treasure! I believe Bridget Byrne said they visited a church with a plaque. She mentioned someone in the church or town asked them why they were at the memorial and she told them about her uncle James dying in the explosion. She did not mention the stone monument in a cemetery. They probably did not know about that. Would you know if the cemetery is outside of the town or near the church? Where did you get these pictures?? 'Attracta Prendergast from Foxford (formerly Regan from Cuiltybo near Kiltimagh) whose grandfather James Byrne from Cloonmore also died in the mine'. 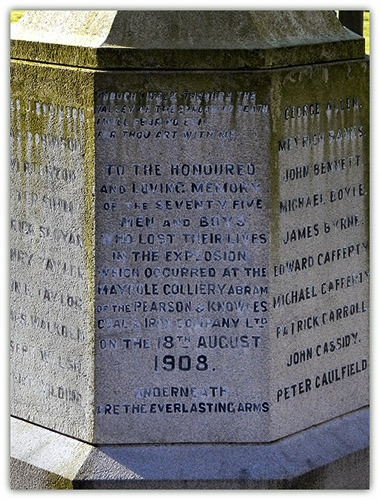 The Maypole Disaster involved an extended inquest from August 1908 to July 1909. There was the inevitable blame game, but the jury reached their verdict; 'caused by the ignition of gas and coal dust combined through shot firing with permitted explosives'. Although some disaster reports suggested James lived on Liverpool Road, Platt Bridge, records at the Wigan Museum confirmed James Byrne lived at 578 Bryn Gates, Bamfurlong, Wigan at the time of the Maypole Colliery Explosion (1908). After the tragedy all hands rallied round and a disaster fund was set up; Maggie and young Winifred benefitted. The Relief Fund records noted that on 21st October 1925, Molly Bryne was still receiving educational fees of £6.00. This John P Birchall site is full of information on James Byrne before he married my grandfather's sister. He seems to have had quite a life before he met grandfather's sister. Hmmm. I don't know how much is fact or fiction. I like proof not prose. This is going to take some time to read and decipher. Well, Fionn, I can not thank you enough for all this information. It will help in planning a trip to the town of Abram in Manchester. UK. Hi John, it is very frustrating the way names were not accurately recorded, the Maypole disaster 1908 for example – Wigan World and Irish Democrat has J Burne – Mersey Times has J Burns – and I am sure there are many other publications with the wrong spellin BUT the Monument commemorating their deaths has James Byrne. His name is reasonably clear on lower photo, right side, 5 names down. Maypole Disaster Memorial, St John the Evangelist's Parish Church, Abram beneath which all the victims of the Maypole pit disaster. Fionn, I am the great-grandson of Thomas Lloyd who was one of the 75 who died in 1908 in the Maypole Pit disaster and I have discovered, through my Aunt Eva Morgan (Nee Lloyd), that he was one of the very few bodies who were recovered. Eva attended a memorial ceremony a few years ago but I was unable to attend as I was serving in the Royal Air Force overseas. Does your web site show/know if there are any other proposed future ceremonies?